There are so many reasons we take our son to A Child’s Place at The Ranches that I don’t think I could tell you all of them! First, my son was potty trained at a pretty early age, and his verbal skills are very advanced. I give the daycare a lot of credit for both of those things. I feel like we work closely together as a team to do what’s right for my child, and that’s a great feeling. Also, the fact that they’re a privately-owned facility, not a big franchise, lends to the family feel that’s so important to us. When we take our son in the morning he smiles and runs to join his classmates, it’s great to know that he loves the place he’s going to spend his day. -Val J.
I’ve been extremely happy with “A Child place at The Ranches”. My boy developed so much in the few months he’s been there. He started talking, using the potty, cleaning up after himself, sitting at the table for meals. He was always happy to go to school, I never had to worry about him being gone for so many hours. I knew he was in good hands…. Thank you Kristina and Lisa for caring for my family. -Sincerely, Daniela C.
Upon looking for the perfect childcare for my newborn, I have to admit being nervous. How would I find someone as loving as my mother, who had in-home daycare for 35 years? But then “A Child’s Place at the Ranches” was built in my neighborhood and I knew it was meant to be. I stopped by for a quick tour and was greeted with moms, just like me, who owned the facility. I could feel their love for children and their passion for childhood development. These “moms” were there from Day 1 to answer my questions, to provide me advice, and to calm my “first-time” parent fears. And now I’m pleased to say it’s been 5 years and I now have two daughters who attend “A Child’s Place at the Ranches”. They absolutely love it! They skip into school in the morning, with a smile on their faces, and usually don’t want to leave when I come to pick them up in the afternoon. The staff and the children are their “family” during the day, and I couldn’t feel more secure as a parent of two little princesses. -Merilee B. Over the last 3 years, my experiences with A Child’s Place at the Ranches have been positive and cooperative. The caregivers are loving and supportive of my daughter and I feel confident knowing I am leaving her in a safe and nurturing environment. The front office staff is always available to answer any question or concern I have, with a smile. 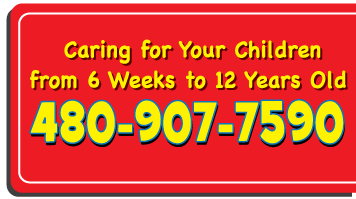 The center’s extended hours and reasonable rates really enhance what they offer over other childcare centers chains. I am pleased to recommend A Child’s Place at the Ranches to anyone who’s looking for responsible, nurturing childcare with a friendly, personalized level of service. -Christine C.
I would recommend A Child’s Place to anyone. It’s a warm, friendly, CLEAN, nurturing, educational environment. If I want to know how my daughter is doing, I can always call and ask or stop in and see how she is doing, if I really need to. I believe I did this once and haven’t had a need to as I know she is being taken care of in such a way that I need not worry!!! Thank you to EVERYONE for taking such good care of my daughter. – Lisa (and Justin) D.
Before we moved to Gilbert, we began looking for childcare in the area as we knew our jobs were relocating us to Gilbert. We were nervous about finding quality care as we were happy with our previous center in Glendale. We looked at many centers in the area (including the corporate centers). As soon as I visited A Child’s Place at the Ranches, we knew we had found the right place. Not only are the employees welcoming and knowledgeable, the rates were within our budget. I must admit, I was still nervous at the beginning. Now, I can happily say that we love A Child’s Place at the Ranches! Emma loves to come every day and that is very important to us. She loves her teachers and has learned a lot in the preschool program. Working in education, I know firsthand how a quality preschool experience can help children in their school years. After attending A Child’s Place at the Ranches, I feel confident that Emma will be more than prepared to enter kindergarten. I can’t wait to see how much more she will learn in the coming year. Thanks for making Emma (and her parents!) so happy! -Greg, Emily, and Emma K.
Share your experience! Click here to download our testimonial submission form.